Arriving in Luang Prabang was like stepping into a fairy tale. Never before in Asia have I ever seen such a charming place, with tiny winding alleyways linking magical streets, a colourful jumble of buildings that looked like they were falling over each other and the majestic Mekong hemming the city in. Monks could be seen in the streets, walking along under their umbrellas to protect them from the sun, or cycling along the side of the road. Temples seemed to mark every street corner, and through the trees you would often be able to see a flash of gold, part of an intricate dragon or a towering pagoda. I was hooked. The centre piece to the town is a mountain rising up in the middle, with a monastery and many reposing Buddha statues located at the top. It is an inspiring place of worship, but also a fascinating place to visit for its cultural heritage and its stunning views over Luang Prabang and its surrounds. When I had staggered my way to the top, I was greeted by a smiling monk who was keen to practice his English. He invited me to sit with him and we talked about my travels, his life as a monk, life in Laos and life in the UK. It was just 15 minutes, but it was a fascinating insight into a life so different from my own. He told me that he had been a monk for 8 years, but would be leaving when he turned 18 to study at university. He wanted to study in Thailand and to ultimately work in tourism, hence his desire to improve his English. This is a common theme amongst many monks in Laos. They are sent to study Buddhism, which gives them a great education and a bit of basic English – with these gifts, they can have a valuable step up in life. 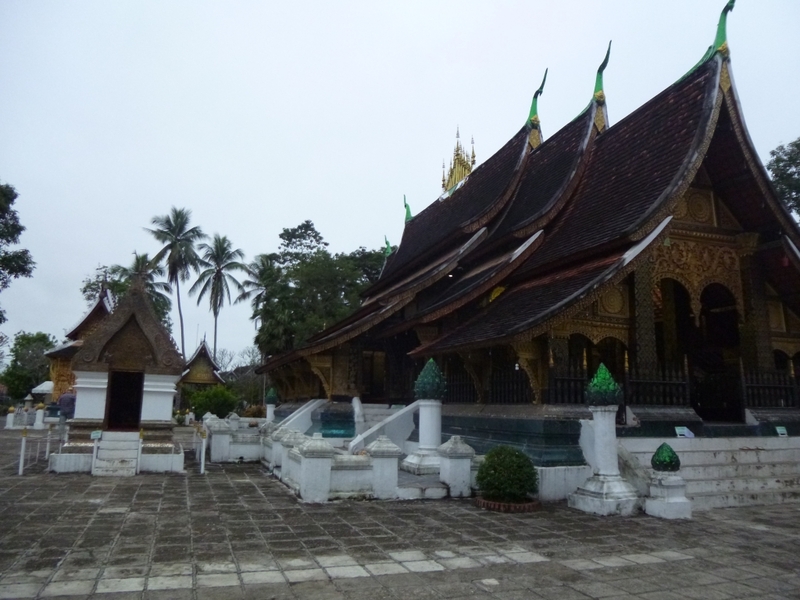 Luang Prabang has a plethora of beautiful Buddhist temples, which are certainly worth the visit. Not only will you see some incredibly intricate architecture, but you might also be lucky enough to hear the monks chanting. Another hit on the tourist trails is watching the monks take their alms at sunrise. 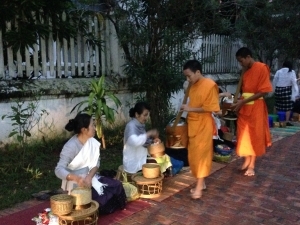 Local people line the streets giving rice and food to the monks, who walk past them collecting the donations. It is an incredible sight to see so many orange-robed monks in the street at one time. I woke up at the crack of dawn to be able to witness this incredible sight, and I am so pleased that I did. Luang Prabang is a beautiful place to be in the early morning. There is a lovely quiet over the city, interrupted only by the footsteps of the Buddhist monks walking to receive alms. The mist rises slowly from the Mekong river, leaving an eerie glow over the trees. Occasionally bells will toll in the temples, and the day slowly arrives as the market sellers start to set up their stalls for the day. The stalls are vibrant and the markets are buzzing. You can buy all manner of spices, fruits, vegetables, meats, fish, homewares and more. They are great fun to wander through to enjoy the local vibe. In addition to the amazing religious heritage here, there is a presence of the colonial era, with amazing French restaurants, cafes and bakeries all over the city. If you have been on the road for a while, there is nothing more pleasant than getting stuck into a good sandwich! There are also lots of tour operators and trips into the local surrounds, so that you can really immerse yourself in the Lao lifestyle and culture. The night market is another highlight of Luang Prabang. As the sun sets, a whole road is shut to traffic and is taken over by stalls selling all manner of wonderful Laos handicrafts. Scarves, purses, notebooks, alcohol, books, fabric and much more. It is enchanting to wander through the stalls greeting the sellers and marvelling at the intricate work of their products. 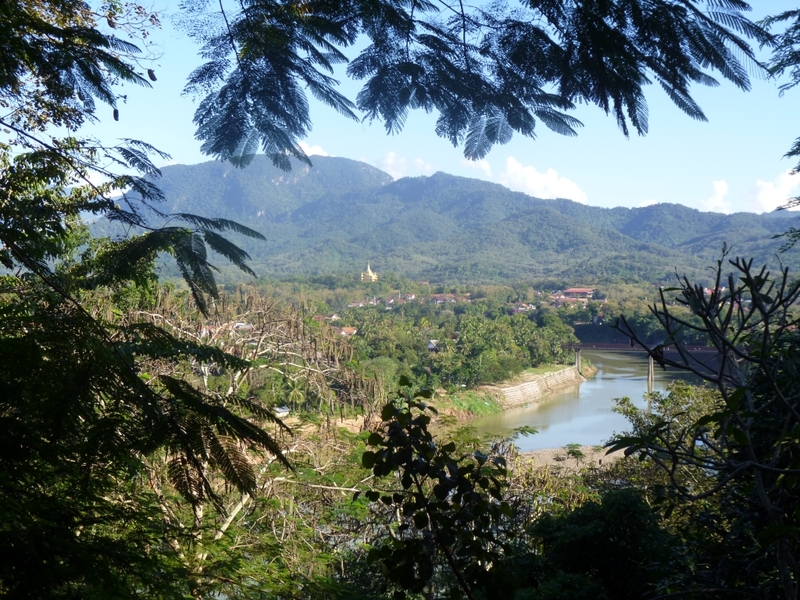 Luang Prabang is a fantastic base for starting our elephant conservation volunteer project, and becomes an amazing home to our teaching volunteers. You will soon be calling it home. Next Post Volunteer teaching in Laos in a day &#8211; if only I could have stayed longer!